Hall, D.K. and Riggs, G.A. (2007) Accuracy assessment of the MODIS snow-cover products. Hydrological Processes, 21(12):1534-1547. NASA. (n.d.) The MODIS snow and sea ice global mapping project. Accessed February 24, 2011. U.S. Drought Monitor. (2011, February 22). National drought summary – February 22, 2011. Accessed February 24, 2011. NASA Earth Observatory image by Robert Simmon, based on data from the MODIS Snow and Sea Ice Global Mapping Project. Caption by Holli Riebeek. The left image shows how much energy the Northern Hemisphere’s snow and ice—called the cryosphere—reflected on average between 1979 and 2008. Dark blue indicates more reflected energy, and thus more cooling. The Greenland ice sheet reflects more energy than any other single location in the Northern Hemisphere. The second-largest contributor to cooling is the cap of sea ice over the Arctic Ocean. Image by Rob Simmon, made with data provided by Mark Flanner, University of Michigan. Caption by Holli Riebeek. At 12:51 p.m. local time on February 22, 2011 (11:51 p.m. February 21 UTC), a 6.3-magnitude earthquake struck the South Island of New Zealand, the U.S. Geological Survey (USGS) reported. Several smaller aftershocks followed. The quake occurred near the city of Christchurch, a community of some 400,000 residents on the east coast. The initial death toll was 65, according to news reports, and authorities warned that the toll could rise sharply as search-and-rescue efforts continued. 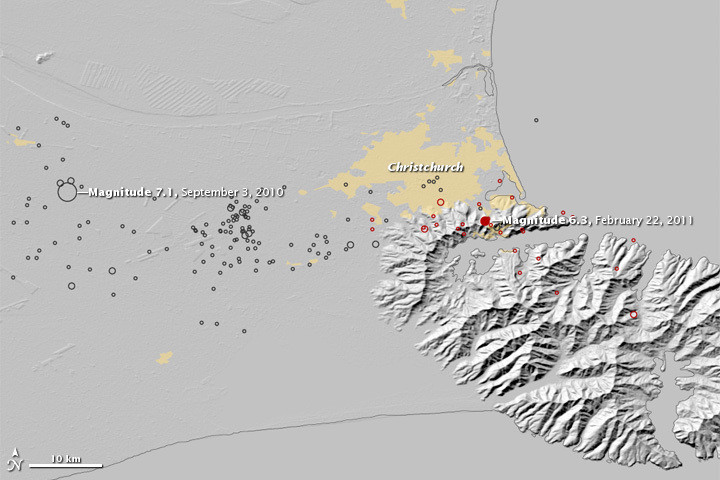 This map shows the earthquakes that occurred near Christchurch since September 3, 2010. On that day a magnitude 7.1 quake struck to the west of Christchurch. Black circles represent earthquakes from September 3, 2010, until February 21, 2011. Red circles show the locations of the magnitude 6.3 quake and aftershocks on February 22 and the morning of February 23. Larger circles represent stronger earthquakes. Yellow shows urban areas, including Christchurch. The USGS characterized the 6.3-magnitude quake on February 22 as an aftershock of the quake that struck to the west, in Darfield, New Zealand, on September 3, 2010. Darfield lies about 50 kilometers (30 miles) west-northwest of Christchurch. Although no specific tectonic structure linked the two events, numerous aftershocks of the September quake occurred along a roughly east-west line, as this image indicates. The USGS stated that the quakes were associated with regional tectonic plate boundary deformation. The Pacific Plate and the Australia Plate interact under the South Island of New Zealand. The Darfield earthquake in September 2010 caused no casualties, even though it had a higher magnitude. Besides striking closer to a major population center, the6.3-magnitude Christchurch earthquake had a depth of just 5 kilometers (3 miles). The New Zealand Herald reported that, whereas the Darfield quake happened in the early morning hours, the February 22 quake struck at the “worst possible time” of day—at the lunch hour when city streets were crowded with shoppers, diners, office workers, and school children. Moreover, some of the buildings that collapsed may have been weakened by the September 2010 quake. Effects of the Christchurch earthquake were felt some 200 kilometers (125 miles) away, along the South Island’s west coast. A 30 million-tonne (33 million-ton) chunk of ice broke off from the Tasman Glacier, and slid into Tasman Lake. In fact, officials had expected ice would break off the glacier, although they expected the event to result from heavy rainfall caused by La Niña. 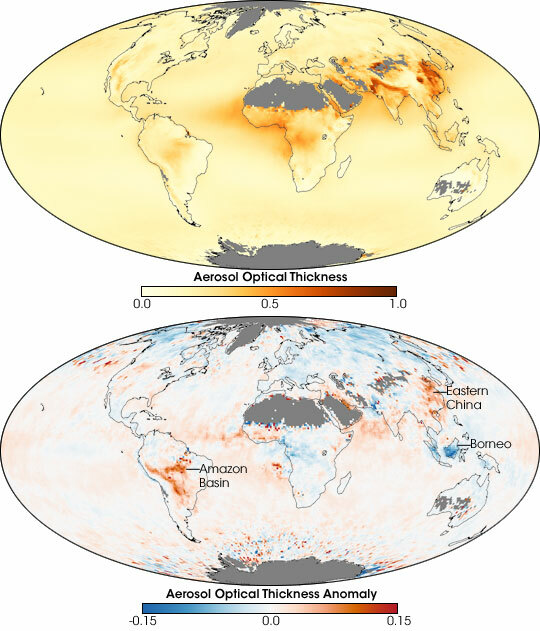 Author Tara BuakamsriPosted on 20/02/2011 16/04/2019 Categories Earth ObservatoryTags aerosol patterns, Aerosols, ละอองฝุ่นควัน, ละอองลอย, โรงไฟฟ้าถ่านหิน, boreal forest fires, burning season, Indonesia, latitudes, the island of BorneoLeave a comment on ละอองลอย(Aerosols) – ฝุ่นละออง(ถ่านหิน)ในสายลม!